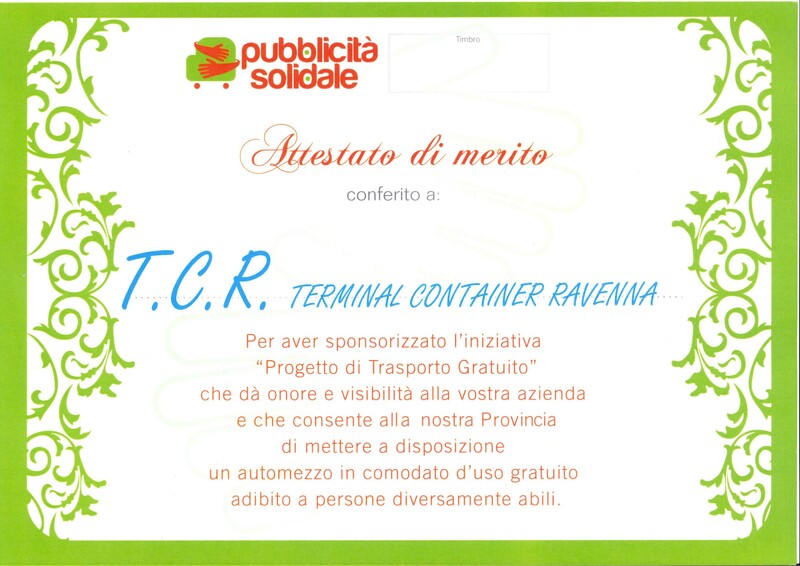 Terminal Container Ravenna (TCR) has enthusiastically joined the initiative “Free Transport Project” organized by the Italian Multiple Sclerosis Association (AISM) with the patronage of the Province of Ravenna. Thanks to the support of TCR, AISM Ravenna will receive a vehicle equipped for the transport of people with Multiple Sclerosis. This vehicle will improve these people’s lives, providing an important support to their freedom of movement. TCR has always been integrated in the community of Ravenna and has supported the social initiatives, working with local organizations that help those less fortunate. Milena Fico, General Director of TCR, comments: “TCR has always considered important to participate in social initiatives organized in the area. The terminal has been organizing guided visits to its facilities and collaborating with public institutions and social organizations. We believe it’s essential to raise social awareness among the people especially those initiatives that improve the quality of life of the less fortunate”.